Bon is a Buddhist summer festival held every year when the moon is full during the seventh lunar month. It is to honour the spirits of dead ancestors who are visiting descendants in the living world. Also known as the Lantern Festival, lanterns are used to guide spirits to and from where they came. 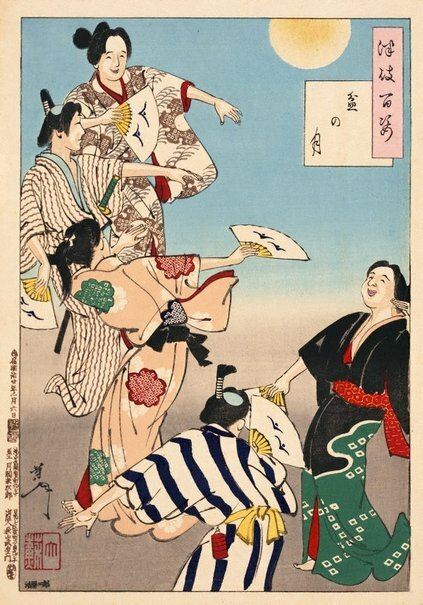 In country areas a dance called 'bon odori' is often performed, where men and women dance in a line or circle, clapping and singing. They wear light cotton 'yukata' robes and dance with fans. Young men, such as the figure in the lower centre of the image, wear robes with geometrical patterns and tie their hair up in tight queues.